Founded in 2014, Row360’s mission statement was to present rowing in a new light; to excite, invigorate and enlighten. Today we publish six issues a year in both print and digital format for readers all over the world. We remain an entirely independent publication, seeking only to cover the most inspiring and engaging stories, events and individuals in the sport. Our team comprising writers, photographers, current Olympic athletes and sports scientists share a deep passion for the sport and represent the best talent in rowing journalism from around the world. We hope you will agree that we have created something dynamic and engaging that truly captures the beauty of our sport. We welcome your opinions and ideas, so please do get in touch. A rower, photographer and writer, Benedict discovered rowing as a schoolboy at Pangbourne College. He went on to represent Great Britain at the Junior World Championships in ‘05 and ’06 before heading to the University of California, Berkeley to study and row. Wins included the Head of the Charles, Henley Royal Regatta and two IRA national championships with the Golden Bears between 2007 and 2010. After a brief stint coaching rowing, Benedict joined Row360 in 2016. Rachel started rowing for a bet in the summer of 1987, and was promptly hooked, learning to cox a term later. She coxed at club, elite and at several international regattas, winning with over thirty clubs, and won a bronze medal steering a Commonwealth New Zealand M4+ which included Mahe Drysdale. Writing credits include The Rowing Service (web), Regatta magazine, The Independent newspaper and she became The Telegraph’s rowing correspondent in 2002. She tweets as @RowingVoice. At Rio 2016, Tom added Olympic champion to his European and two world championship titles. He won a bronze medal at London 2012, his first Olympics. An honorary lifetime member of York City Rowing Club he helped win the club’s first Henley Royal Regatta trophy. He holds multiple course records from Sydney to Henley-on-Thames. A former Cambridge Blue, Tom read Management at the Judge Business School, following a degree in History of Art. Christopher covered rowing for The Guardian and Independent, was founding editor of Regatta magazine and is co-founder of the River & Rowing Museum. His many books include Henley Royal Regatta (1981 and 1989) and he is currently writing a biography of Jürgen Gröbler with Hugh Matheson. Born in London, Martin was educated at Cardinal Vaughan Memorial School. He studied at Queen Mary University of London, rowing for the college boat club. He won an Olympic gold medal in the coxed four at the 1984 Los Angeles games with Sir Steve Redgrave. His autobiography, Olympic Obsession, was published in 2001. Martin writes about rowing for The Guardian and co-commentates for the International Rowing Federation on the world rowing cup and world rowing championships events. Emily is a senior captain for Bryn Mawr College Crew, found just outside Philadelphia. She conducts research on a number of topics, including physiology, psychology, ecology, and marine biology. Emily began rowing as a sculler for the Central Pennsylvania Rowing Association in high school, and now enjoys collegiate sweep rowing, despite only getting to have one oar. Valery has worked as the biomechanist for both the Australian and British Olympic teams and is considered the world expert in the field of rowing biomechanics. Kleshnev won a silver medal racing in the heavyweight men’s quad for Russia at the 1980 Olympics before gaining a PhD in rowing biomechanics. A fifth generation New Zealand horticulturalist, Steve is New Zealand’s most published and travelled rowing photojournalist. The son of a rower, husband to a rower, father of four rowers and unknown for being four-seat of an eight for a few seasons, where everyone in front (including the cox) competed at the Olympics. Steve is now focused on capturing the run-up to Tokyo 2020 in images and words. 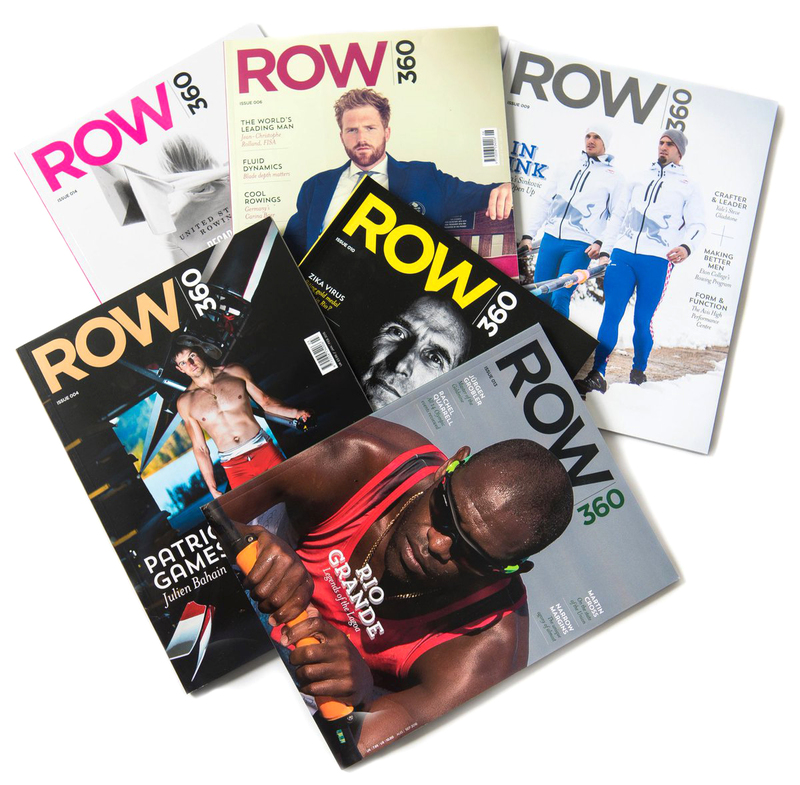 Row360 is published by Rowing World Limited. Copyright Rowing World Limited. All rights reserved. Reproduction or transmission by either electronic or mechanical means, including photocopying, recording or any information storage and retrieval systems is prohibited without the prior written permission of the publisher. Subscribe and receive the best in rowing journalism, opinion and photography, year round, worldwide in print and digital format. The world’s independent rowing magazine is published six times a year, covering the most engaging athletes, coaches, and teams from Olympic, Paralympic, college,club, indoor and junior rowing.